We provide financial security planning to individuals who have a concern for themselves, their families, and their community. There are three stages of financial security. I call those stages financial dependence, independence, and transcendence. We engage in a listening and questioning process that helps clients discover where they are in the continuum. Based on our experience and training, we know that financial planning fails or is not executed, because of 4 things. Lack of clarity, lack of confidence, lack of capacity, and lack of control. Our planning process helps to identify and overcome these barriers, allowing our clients to secure what they value. Clients can engage us in a commission and/or fee agreement for single purpose or comprehensive planning. Once planning has reached the implementation stage, we are paid a commission by the provider whose product best suits your planning requirements. On a fee basis, you engage us for an agreed upon fee for the planning you require. You are free to implement the solution with your existing suppliers or we can help you implement through our office. We offer a comprehensive suite of products and services to help our clients achieve their financial vision of 'Securing what you value'. Whether you are financially dependent, independent, or transcendent, these are highlighted on the right side of the web site. Click on the 'BP' logo to find out more. I joined the Responsible Investment Association (RIA) in 2003. It is a voluntary non-profit organization consisting of NGOs, individual investors, fund company managers, planners, and pension fund managers. Check out the site at www.riacanada.ca. Socially responsible investment (SRI) is the integration of environmental, social and governance factors in the selection and management of investments. 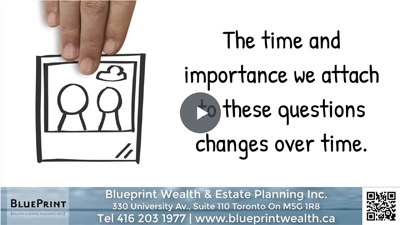 Although I have a personal preference for SRI, and many of you have asked me over the years about SRI, as a financial planner I have to weigh the emotional attraction against the long term interest of my clients. SRI is an additional constraint placed on an investment manager, which can narrow the choice of investments available to the manager. In the Canadian investment universe, there are only about 1500 equity investments available, and of that only about 350 are considered 'investment grade'. Because of this, there is considerable duplication of individual securities between a conventional fund and an SRI. The separation between two funds is usually found in the prospectus. In an SRI prospectus, the investment criteria are spelled out. There are different criteria to determine an SRI. One criterion would be to use positive or negative screens in security selection. Another would be to choose 'best of breed' in order to be invested in all sectors of an index. As an example, a negative screen might preclude a fund manager from selecting a forestry stock for the portfolio. A 'best of breed' manager might choose company ‘X’ as its sector pick, because it does not use old growth forests and has the best reforestation process in the sector. Another criterion would be to choose a fund because you want the manager to use its investment to try and influence company management to change its practices, and hopefully result in enhanced shareholder value A final SRI criterion would be shareholder rights or corporate governance. There are fund managers who belong to the Canadian Coalition for Good Governance, yet are not RIA members. Each SRI Manager or plan sponsor has their own set of values that is imposed on a fund, and these values may not coincide with your own. As you can see, there are shades of gray in SRI. I am happy to meet with you if you wish to consider SRI funds in your planning. However, goals and objectives, risk assessment, asset allocation, diversification, risk management, and time horizon are first principles in your planning. I am qualified by training and experience to provide fee only planning. A fee only planner charges a fee for a specific financial plan. The fee agreement is prepared separately and is subject to GST or HST*. The planning is either modular or comprehensive. The nature and scope of the planning will be disclosed in the agreement. You are free to implement the plan with your existing set of advisors. If you choose to implement elements of your plan with me, I will receive compensation from the product suppliers I represent. I am prohibited from rebating the planning fee if you implement with me. "Yesterday is a cancelled cheque. Tomorrow is a promissory note. Today is legal tender. Spend it wisely.